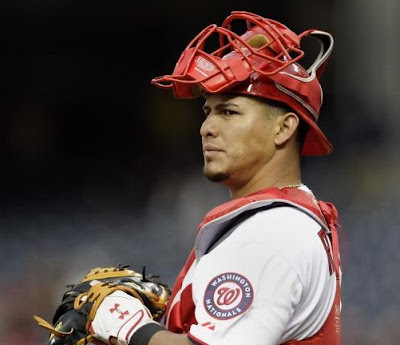 Washington Nationals catcher Wilson Ramos, who was playing for Tigres de Aragua in Venezuela's Winter League, was taken from his home by four armed gunman Wednesday night. The vehicle used during the crime was later found abandoned in a nearby town, according to reports. The captors have yet to make contact with Ramos' family, Domingo Alvarez, vice president of the Venezuelan Professional Baseball League, said this morning. It's believed that the abduction is the first involving an actual Major League Baseball player, though relatives of players have been targeted in the past. A son and brother-in-law of Yorvit Torrealba, then with the Colorado Rockies, were released one day after being taken in 2009, and the mother of former pitcher Victor Zambrano was rescued after a three-day ordeal later that year. Also, the mother of two-time All-Star pitcher Ugueth Urbina was rescued after five months of captivity back in 2005. In 2011, Ramos played his first full big league season and became Washington's everyday catcher, hitting .267 with 15 homers and 52 RBI. His home run total is a team record at that position. In a brief statement issued earlier this afternoon, the Nationals said, "Our foremost concern is with Wilson Ramos and his family, and our thoughts are with them at this time." UPDATE: The ordeal came to an end on Friday, when Venezuelan police rescued Ramos in a flurry of gunfire and arrested his alleged abductors.